The Government of India announce with profound sorrow the death of Shri Atal Bihari Vajpayee, former Prime Minister of India on 16th August, 2018, at AIIMS Hospital, New Delhi. As a mark of respect to the departed dignitary, it has been decided that seven days of State Mourning will be observed throughout India from 16.08.2018 to 22.08.2018, both days inclusive. 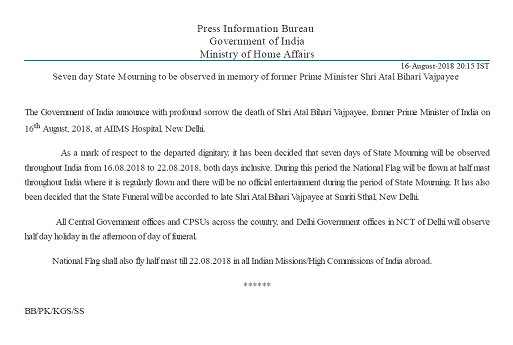 During this period the National Flag will be flown at half mast throughout India where it is regularly flown and there will be no official entertainment during the period of State Mourning. It has also been decided that the State Funeral will be accorded to late Shri Atal Bihari Vajpayee at Smriti Sthal, New Delhi. All Central Government offices and CPSUs across the country, and Delhi Government offices in NCT of Delhi will observe half day holiday in the afternoon of day of funeral. National Flag shall also fly half mast till 22.08.2018 in all Indian Missions/High Commissions of India abroad.